The PAF pickups revolutionized the world of music, and effectively separated the use of electric guitars, while making the sound clearer and more versatile at the same time. While this technology has changed over the years, the use of dual and band coils in the vibration receptors of your guitar makes a striking difference in performance according to your musical genre. This is why, in this article, we are going to review the 5 best PAF pickups on the market and show you exactly what to look for when getting your new set. FOXNOVO offers a nice set of pickups replacement, originally designed to fit the Gibson Epiphone Les Paul models, it is a good option to consider if you are in a budget. Their design consists of a simple rectangular plate just like Epiphone’s originals but furbished in deep black plastic and copper materials. The FOXNOVO pickups are wax dipped three times and vacuum sealed in order to eliminate the noises resulting from feedback vibrations and include four screws for height adjustment upon purchase for each pickup piece. Besides, these models are designed to reproduce the warm sound of the first Epiphone Les Paul models that Gibson thrower to the marked in the early 60’s guaranteeing an extremely warm and clear sound with extra strength from nowadays technology. The set brings you both pieces for the neck and bridge positions at a really low price, and work as a perfect and some may say even upgraded replacement for your old set. 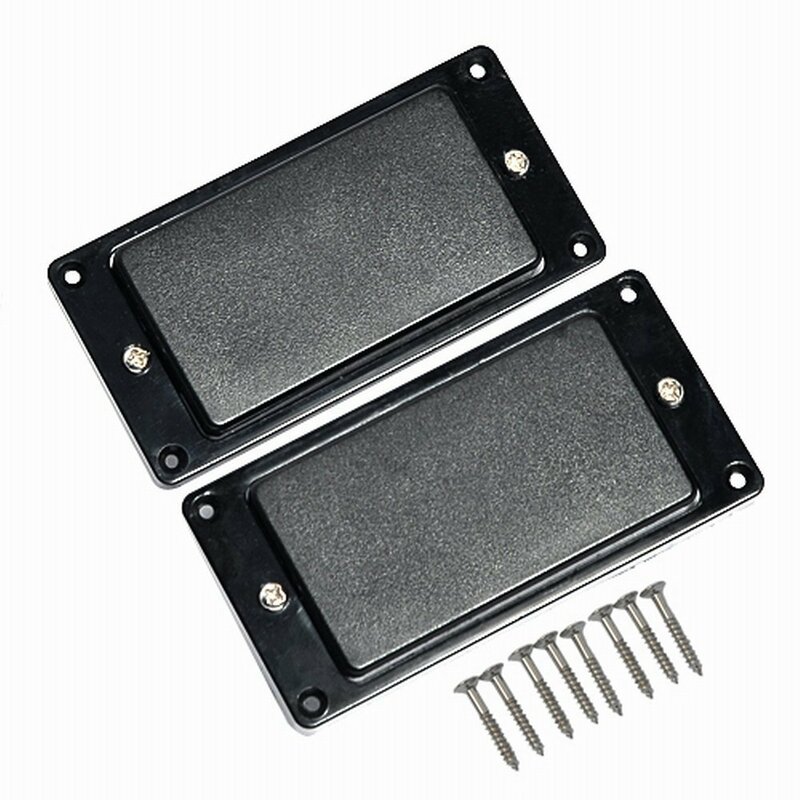 On the downside, this humbucker set is designed to fit only with Les Paul model’s system and space, being not fit for all guitars and probably require you to make some adjustments before being able to play. 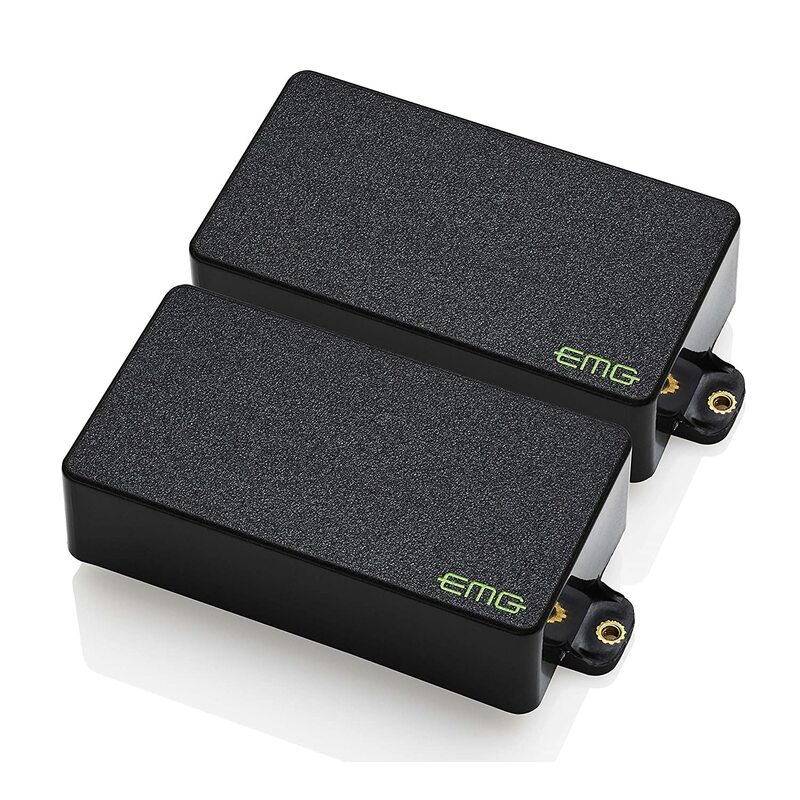 Moving on to a more advanced pickup for your guitar, EMG offers an incredible set of pieces all over its humbuckers that promise to be easy to install which is usually the nightmarish part when changing your pickup system. As you can imagine by its name, the Kirk Hammett Bone Breaker is designed for a more metallic and dried sound, aiming to emulate the strong and vibrant sound of Metallica’s star guitar player. This model is specially designed with elements to sustain more volume at the highs for amazing solos and at the same time the possibility to switch the mode which will give you an impressive output in the rhythmic section. As for its variations in looks, they consist of a mate black panel counting inside with a Bb-b ceramic magnet sheet for the bridge and Bb-n Alnico 5 for the neck. Generally, you can get a nice and crisp sound that can rock clean or without the need of big distortion. In addition, keep in mind that you will have to use the EMG install system, which is necessary to make the job really easier. On the downside, based on its quality, set and being backed up by Metallica’s lead guitarist, it has a more elevated price than other humbuckers on the market. There is a special sound that you can only get when year equipment has been used for years, a somewhat cringe sound that comes from your guitar offering a drier, yet pretty much harmonic output, like that grasp of ZZ Top songs and old school Blues and Jazz bands. Well, this Antiquity Humbucker Set by Seymour Duncan is an aged PAF style pickups set, which aims to bring you the rustiness of the sound without the rustiness of old equipment. On the outside, these PAF pickups look exactly like the old original pieces from Gibson, and they are even aged to look like a professional’s rusted pickup with 30 years of performance. Besides their vintage looks, they are furbished to reach rusted tones from Blues, Country and Classic rock with no problems, leading to an amazing sound output without dealing with rusting effect or PAF clone pedals that can harness the high tones. As for the inside, you will get a piece covered with 2.5-inch alnico 2 sheet magnet, with specially machined spacers in nickel and maple, a nickel silver base and one single conductor main wire. All this is magnetically aged with the goal to produce the rusted sound of professional Blues guitarists. On the downside, the Seymour Duncan Antiquity PAF pickup can be expensive and is not that easy to set up. Back to the “on a budget” list, Kmise offers a nice quality of humbucker PAF clones replacement sets for the Gibson Les Paul classic models. About the design, you can get a black ceramic looks sheet covered, a golden copper classical look or silver classical look, all of them rated at 9K, triple wax dipped and sealed in a vacuum. These models are furbished in really decent materials and the price for the set is extremely low, they are designed specifically for Les Paul models with a pole spacing of 52mm for the bridge and 50 for the neck, which can be a pain if you try to install the replacement in another guitar. Unlike other brands, these pickups are designed to achieve their actual mission which is to lead the sound better when you play higher tones, therefore you won’t get additional effects apart from a clearer sound when rocking some solos. On the downside, well, Kmise doesn’t include installation pieces to ease the process, instead, you will have to use a soldering iron to clear the older connection and set the new one. On the other hand, the sound output is amazing, you get a variety in design and they happen to be a great set of PAF pickups for the money. If what you are looking for is to have a great old fashioned sound output with an amazing sunburst design, then the Lace offers a real deal for you. What you will get is a Gibson-like set of PAF pickups with an incredibly good looking unique metal burnt design that won’t be repeated, at a standard humbucker size for you to fit in basically any electric guitar. As for the sound output, this PAF pickup counts with a wide crunch tone which translates in great rusty low tones followed by gritty mid-tones in the high end. Meanwhile, the higher tones of your guitar are strongly defined and kept clear, offering a lesser rust and clearer harmonics. On the downside, the 33062 Finger Burners work at high temperature compared to other humbuckers, which could wear down the rest of your pieces if they are not prepared for the heat. Its peak frequency is 2540 kHz which sounds good, but it actually ranges there, meaning that you will be stuck with a low-end that always sound somehow like metal or hard rock music. Yet, on the bright side, you are getting a high-budget PAF pickups set with a unique design at almost half the price, making this humbucker worth a shot if you play rough styles. By this point you already know what the best humbuckers on the market are, but, to take you out of any doubt, below we tell you how to choose the right one for you. The most popular pickups are the so-called humbucker or double-coil pickups, mostly known as PAF which are usually seen in the purest vintage style models. The design of this pickup model focuses on the sustained and reduction of background noise, by two coils connected in series with polarity and inverted winding. This system is similar to what is used to reduce noise in Stratocaster models, by combining two pads with polarity and inverted winding. With the difference that in one way the pads will be connected in parallel, and in your Humbucker they are connected in series. 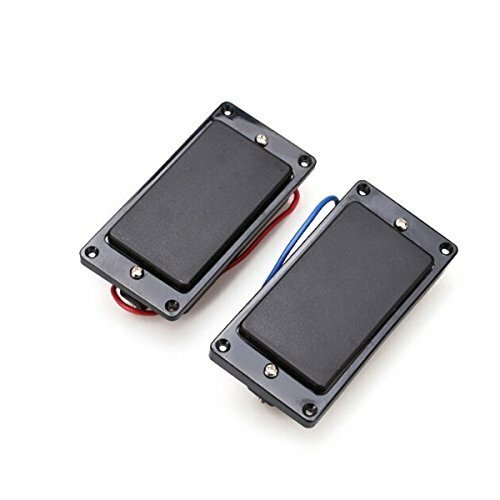 In this case, the noise is reduced, the output level of a single standard pickup is doubled, and the clarity and typical definition of the single coil are practically lost and forgotten. But, by increasing the low frequencies, you’re able to obtain a sound with much more body and improved sensibility to the signal-to-noise ratio. They could be found uncovered or covered with a nickel cap. You will be able to find the same pickups in different colors for the aesthetics of your guitar or your personal taste, and covered versions use a lid which is pretty appealing to the design of the guitar. With or without a lid? By covering the humbucker the nickel cap will slightly affect the sound of your guitar and the sound will become a little brighter. On the other hand, leaving it uncovered expose the receptors to dirt and humidity which will affect their durability, and depending on the materials (more about this below) you can find yourself with some extra gritty noises in a few months. Usually, your receptors will be made of copper or nickel, the later is the best option. Of course, this really has an impact on the price. When it comes to the under the sheet, the material depends in the process of the PAF pickup, if it uses a battery it will develop greater temperature, usually it is covered with ceramics to for obvious reasons. As for passive pieces with no preamp, ceramic is the most used material, and in some cases, they are dipped in wax to increase resistance. The difference here lies in the detail, while active pickups get a more accurate sound thanks to the preamp, they usually also prevent the vibration coming from the wooden parts of your guitar, leaving behind the warm part of the sound. On the other hand, passive pickups are equal to less gain, and also less money spent. 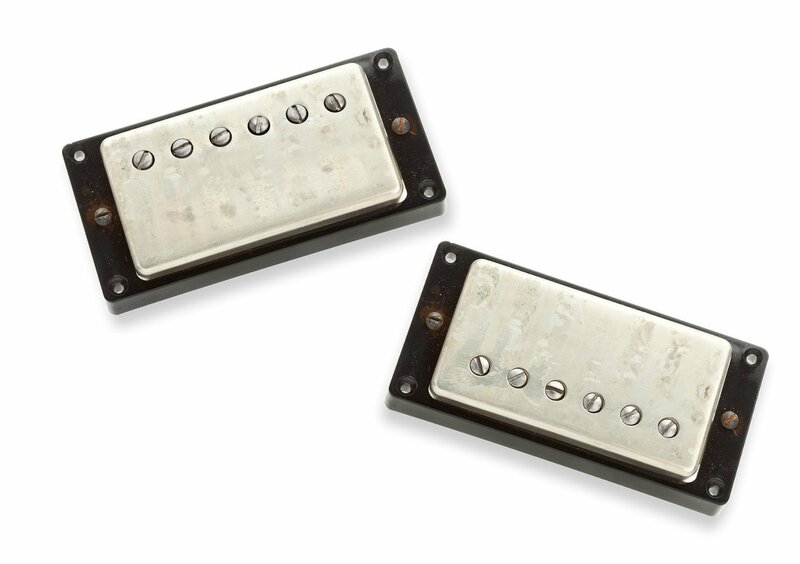 But usually, for styles such as rock, hard rock, and all metal variations, active PAF pickups are preferred. The first thing you need to pay attention to is to know exactly whether is easy to make modification and custom settings or not. It is not that hard to do custom settings, you’ll need a soldering iron, a little tin and some rudimentary knowledge of electronics can be enough to make the change, you can find bunch of tutorials on YouTube. However, in case you want to have a split connection - that goes from a simple pickup to a humbucker - it is best to take it to the technician, it is not an expensive modification. The second caution is to keep the original set. If your guitar is vintage, a change of pads makes it lose value significantly. Also, if the change is made aiming for a specific sound, when you sell the guitar it is possible that the buyer does not share your tastes. If you are looking for a humbucker set that keeps almost any style running, the Seymour Duncan Antiquity will be the best choice because of its versatility. Even though it will probably grant you a visit to your technician. 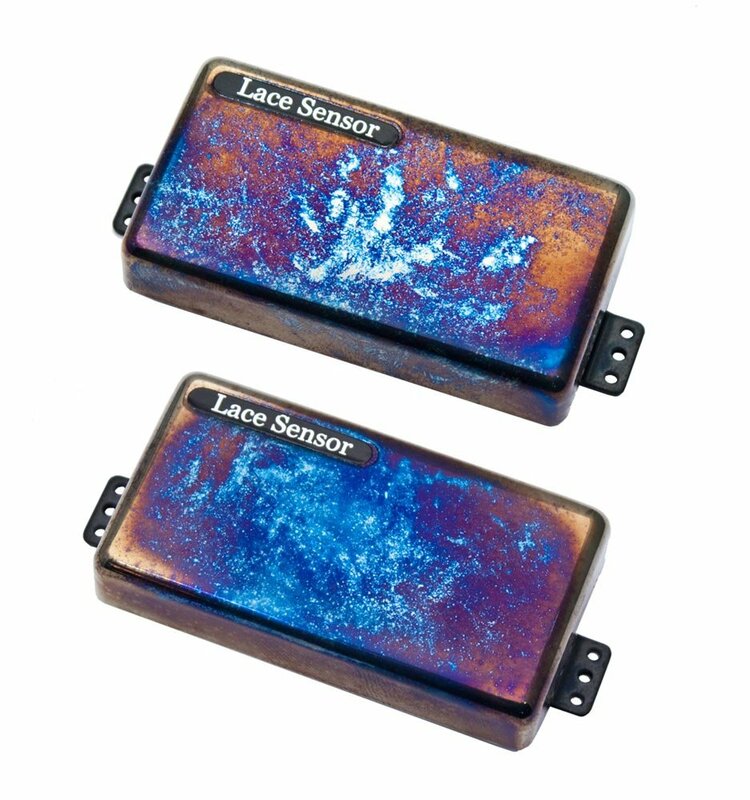 On the other hand, if you are playing rock or anything harder, with great mid and low-end versatility with a crunch sound, you can’t go wrong if you choose the Finger Burners by Lace. Finally, you can go passive with the Kmise replacements if you are in a low budget, even while these have less sound power than the others in our list, they do have a great output and the price is amazingly low. In the end, you need to follow your style, so make sure to choose the right PAF pickups and go break that amp. Don't Be Shy, Share On Social!